From 2001 to 2003, I used to work as an analyst at a Washington, DC based NGO that ran healthcare reform initiatives in the former Soviet Union. What does that mean? It means I proved everyone wrong when they told me I’d never find a job with my Russian degree. But what it really means is that I spent most of my working hours writing reports on how our volunteer US healthcare workers helped out their counterparts in Russia, Ukraine, Armenia, Kazakhstan, etc. with training and getting the resources they needed. If you thought that sentence was long winded, I’m glad you never read any of my reports. Back from a trip to Ukraine, an American neonatologist told me he found out that a doctor over there was keeping much needed supplies on display in a locked cabinet…untouched. Why? If he used them, he would run out. So, if no one used them then he could say that they had some and that they were stocked like a proper clinic. Technically, he’s right. If you want to make sure your inventory never runs out – just don’t use any of it. It’s been ten years since I first heard that story. I’m standing in my kitchen looking at a package of pistachio paste that I picked up in Siracusa, Sicily. I bought it in an amazing food shop right at the end of the town’s open-air market. 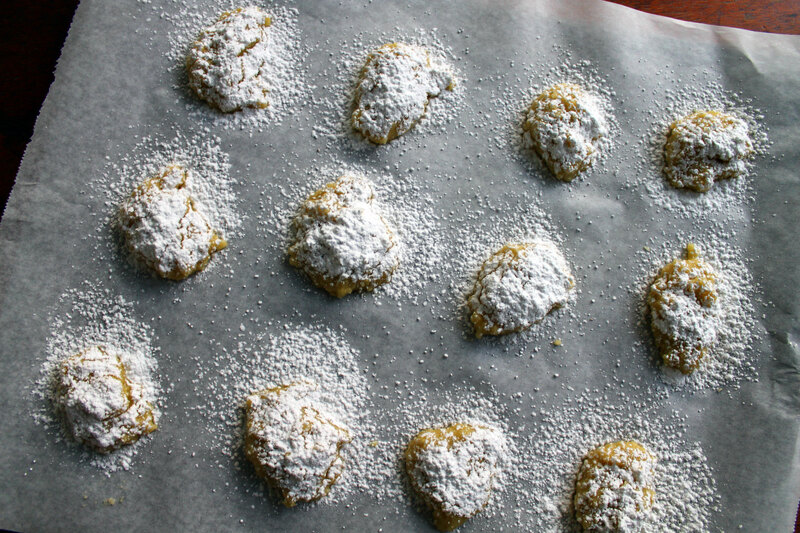 As soon as I saw it, I knew what I would use it for – these almond crinkly cookies that I bake with almond paste that would definitely work with pistachio paste, too. I couldn’t wait to give this cookie recipe a try. Since I got home from that Sicilian trip last December, that package of pistachio paste became an immovable piece of my kitchen counter-scape: toaster oven, salt cellar, pepper mill, pistachio paste, cutting boards, drying rack. Every month or so since that December, my boyfriend has been gently needling me about when I’m going to use it. When does that expire? Isn’t it going to go bad before you use it? No, no, I say. I have time. It doesn’t expire until the end of September 2012. And then it was September 2012. Oh god. I couldn’t put it off any longer but I didn’t want to let it go. And then I remembered that story about the Ukrainian doctor. I was just like him. I remember thinking how asinine that logic was and here I was using the same exact asinine logic except with lovely foodstuffs from Italy instead of medical supplies. I was definitely the bigger fool. Right under the expiry wire, I used it to make the cookies. I boldly broke open the package, tossed the paste into the mixing bowl and started mixing the cookie dough. I felt relief. And excitement! My self-imposed embargo against the pistachio paste was over and I was finally going to make (and taste!) these cookies. After waiting all that time, how did they turn out? Were they these amazing pistachio versions of a favourite cookie? Sorry, but the answer is nope. The cookies were lovely as usual; it’s just that I didn’t even taste the pistachio paste. They just tasted like the regular tried and true almond favourites. What happened?!? Well, when I broke open the package I wasn’t overwhelmed with pistachio-ness. Maybe I did wait too long and the pistachios lost their oomph? Maybe that pistachio paste wasn’t any good to begin with? Now when I look at my kitchen counter, there’s a toaster oven, salt cellar, pepper mill, SOMETHING THAT IS GONE FOREVER, cutting boards, drying rack. In the end, the pistachio paste was better appreciated on my kitchen counter as a memento of my Sicilian adventure than for what I actually bought it for – baking. 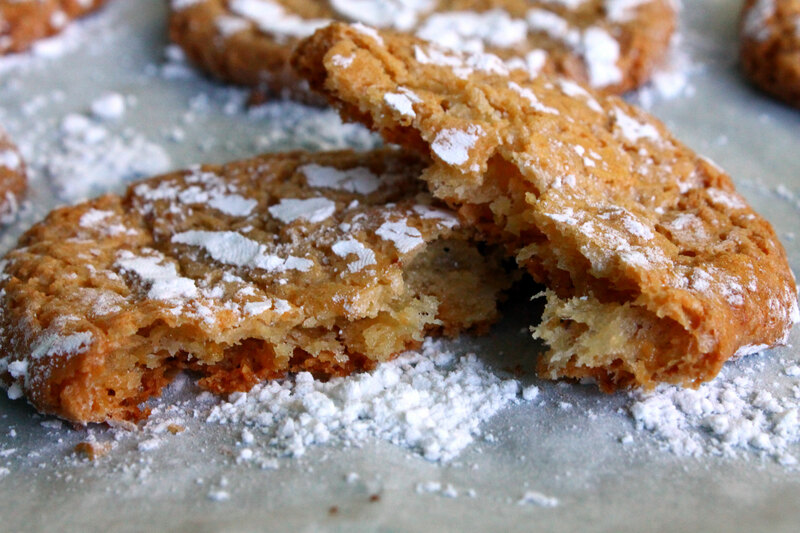 Crying aside, these almond cookies are a proper treat. 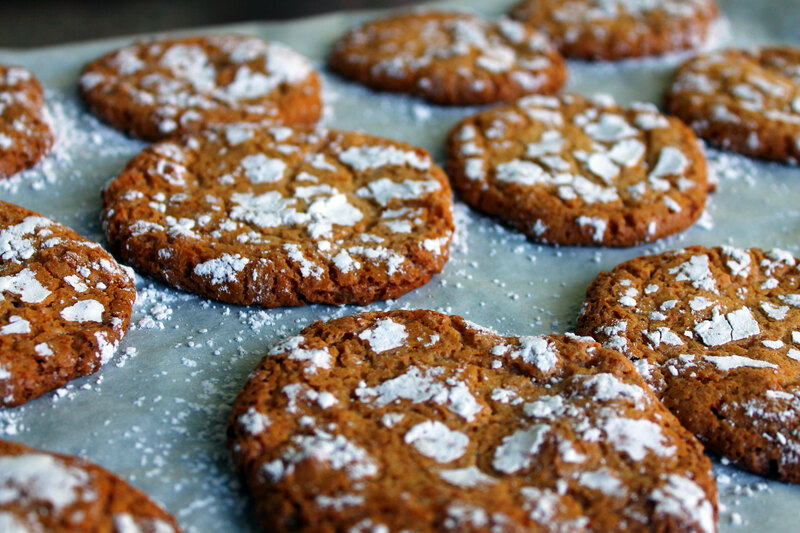 They’re intensely sweet and almond-y. They’re crackly on the outside and chewy on the inside. They are bliss with an espresso, the sweetness a perfect opposites attract match to deep, dark, bitter coffee. *if you want to attempt the pistachio version of this recipe, use 6 ounces almond paste and 4 ounces pistachio paste; 2/3 cup sugar, and 1/8 to 1/4 teaspoon pistachio flavoring. I didn’t have any pistachio extract, so I just used the lemon extract. Maybe the addition of the extract would have oomphed the pistachio flavour? 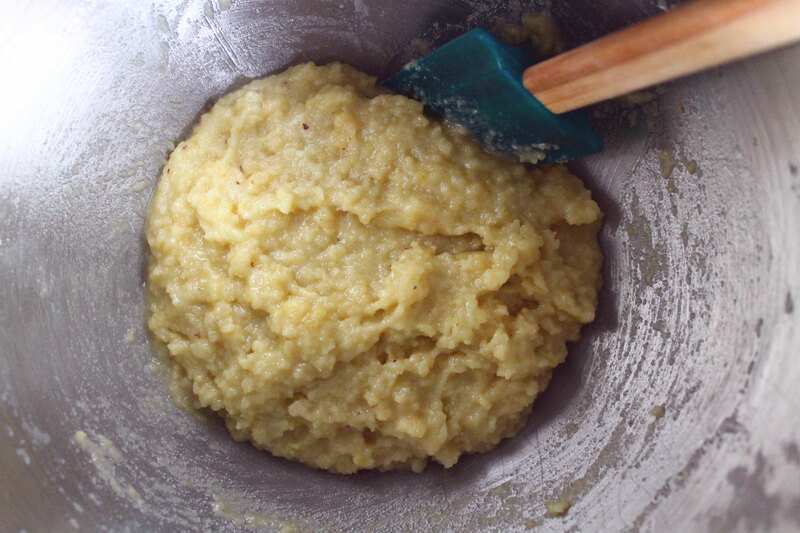 In a stand mixer, blend the almond paste, sugar, and salt until the mixture becomes uniformly crumbly. This will take a few minutes. Add the egg whites gradually, while mixing, to make a paste. It won’t look like it will come together but it will. Stir in the almond and lemon extract. Scoop the dough by heaping tablespoons onto the prepared pans. I find that these can spread out a bit large, so next time I’ll try using heaping teaspoons instead and adjust my baking time for the smaller sized cookies. Sprinkle the cookies heavily with confectioners’ sugar, then use three fingers to press an indentation into the center of each cookie. Bake the cookies for 20 to 25 minutes, until they’re brown around the edges. Remove them from the oven, and let them cool right on the pan. 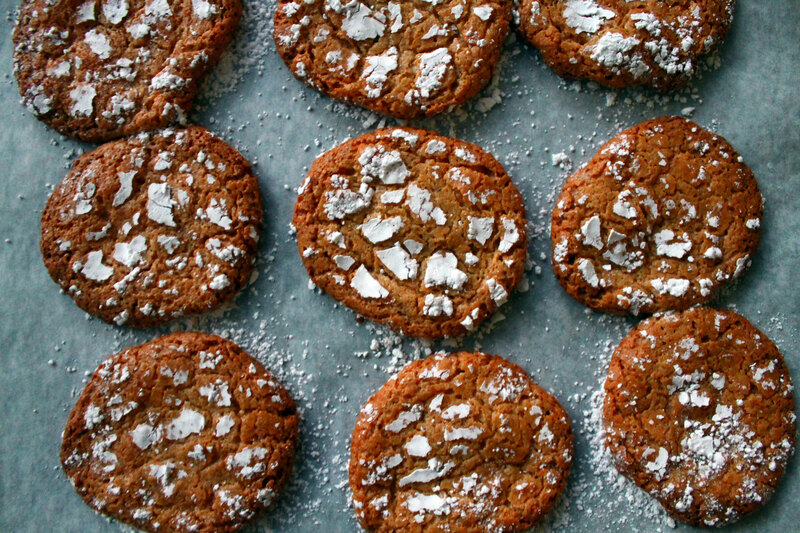 You’ll get about 20 cookies from this recipe. I could read your blogs all day everyday. Such is my admiration and delight. And my need to procrastinate…. Thanks Sue! The feeling is totally mutual! I never thought those reports would be mentioned again! Cannot wait to try this recipe. Catching up on my FA. Great post! Where can I find almond paste? Is it a specialty store type ingredient? I find it at St. Lawrence Market in the lower level at that giant bulk store. They have almond paste around the holidays. From the King Arthur Flour website where I got the recipe, other bakers ordered it online.